And community development fits in…..
1) Create conditions to allow people to appreciate their capacities and begin to understand the diverse capacities of other people, institutions, physical elements and so on in their vicinity. 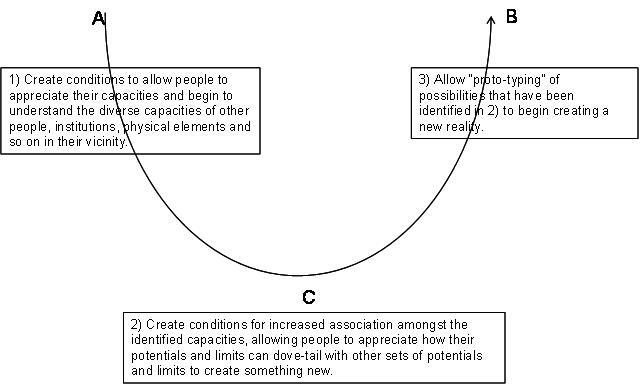 2) Create conditions for increased association amongst the identified capacities, allowing people to appreciate how their potentials and limits can dove-tail with other sets of potentials and limits to create something new. 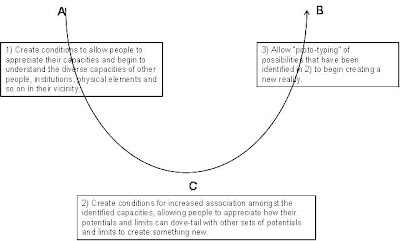 3) Allow “proto-typing” of possibilities that have been identified in 2) to begin creating a new reality. I don’t think it is too difficult to see how these notions fit against the “U” path (diagram 6). They do so in a similar vein to the ideas I have been expressing with the Christian concepts previously. Unlike the controlled world of A to B problem solving this is a more chaotic process of encouraging each entity to find its authentic nature and celebrate that authenticity in community with other entities. It begins to rewrite the measured story of “right and wrong” and challenges us to think how every-thing, whether it be perceived as gift or pathology, might belong. You have “disability” x but abilities a, b and c. I have ability y that supports your disability x but need your abilities a, b and c for another challenge I am facing. We were made for each other. Because everything belongs, there are few if any rote solutions to a problem. The combination of gifts, capacities (and pathologies) in every local place is different and invites a different – and creative – response. We can’t make a particular “thing” fit a global system under this model. The system has to adapt to fit the thing. Hold on a minute. We can't change the system to fit every unique aspect of the cosmos can we? That would be highly inefficient? By whose definition of "efficiency" do these questions arise? I'd like to suggest that the uniqueness and diversity exists as a challenge towards us unleashing extraordinary creativity. Otherwise we are wasting that diversity, which is the ultimate in inefficiency!